Concert pics are coming up tonight (Friday 8th Feb 2008 - 0200 GMT + 8), in the United States that'd be Thursday 7th Feb - 2PM. Cheerios... i know y'all been waiting for it! Life is all about FOOD, or is it that FOOD is all about LIFE? Mwhahahaha... This post is split into 2 where i'm going to tell you what happened yesterday over lunch and late lunch and lunch today! Was at Kelana Jaya for lunch with some friends, we all met up at the office and ordered Dominos Pizza, BBQ Wings, and drinks for all to share! Pictures are below! Btw, it was a photo studio...in Kelana Jaya! Awesome place, great pics..
My working hours is weird... so yea, i had the opprtunity to have lunch with Jack today at Mama's Kitchen. 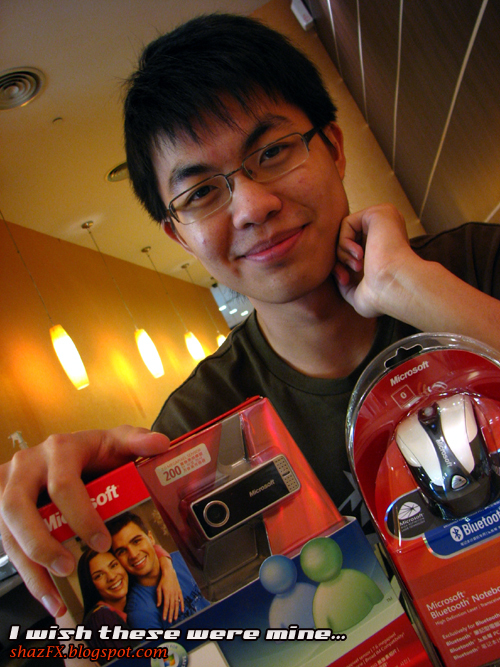 We both spent RM4 each for lunch! Marmite chicken was goooood!!! Cornetto Sundae Chocolate was awesome!!! We had all sorts of pizza flavors from Dominos Pizza... (L-R: Bryan, Christin, Me, Kim, Cecilia, Shayna). 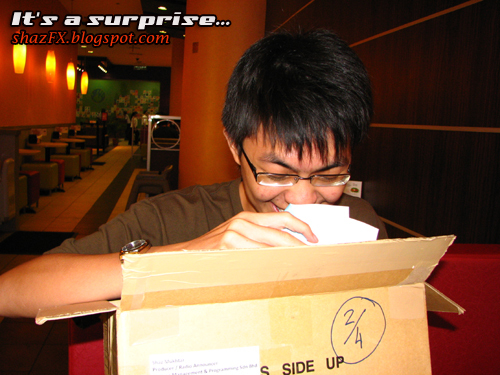 It's a surprise...what's inside this box? Wahhh Ken so happy wei! Is it his Xmas present and B'day present? Ok la... Ken's bday was last 13th November! Organised a small b'day celebration for 5 november babies back then! But still haven't given him his b'day present... might this be the present? 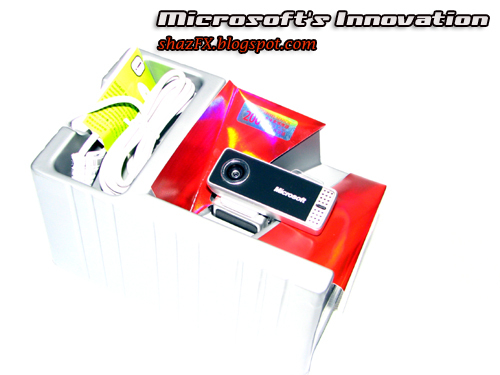 The Webcam goes up to 2 MegaPixel when using the webcam feature, but when used for still photos goes up to 7 MegaPixel and uses CCD Sensor. 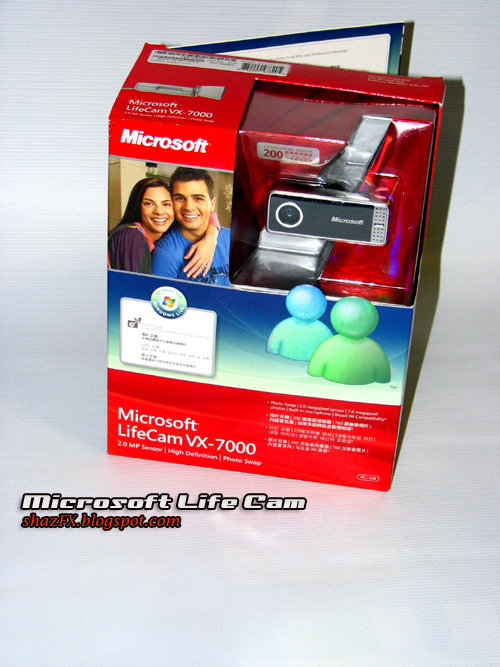 My new Microsoft LifeCam VX-7000, awesome cam! 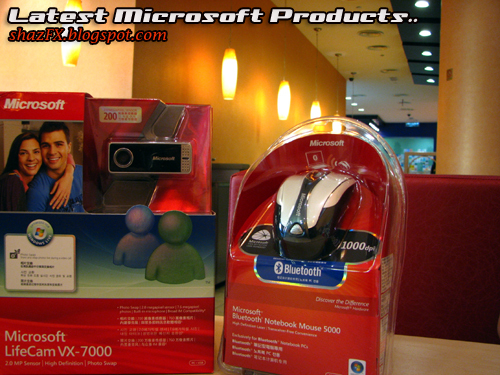 Now retailing at about RM 269 - 300 if i am not mistaken! 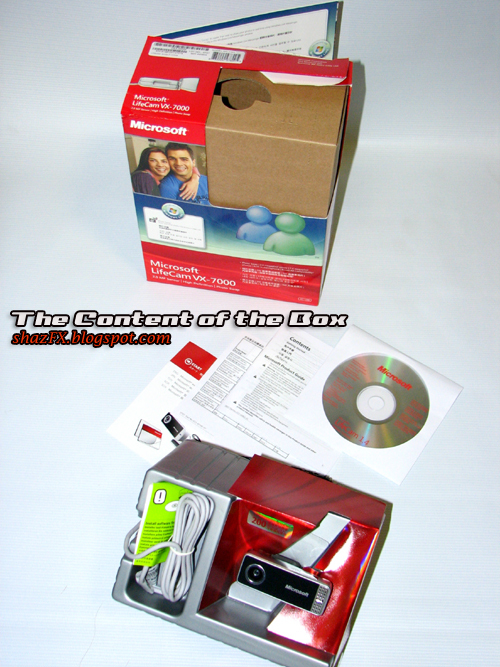 The contents of the box, the webcam comes with its cable, installation CD and warranty information! 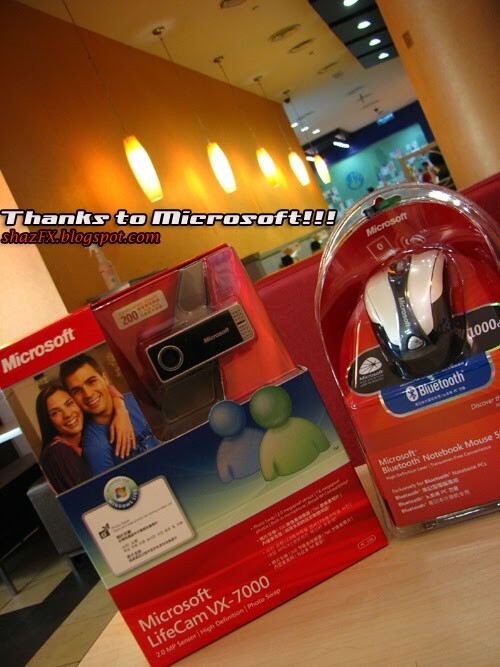 Thanks to Microsoft for these products! 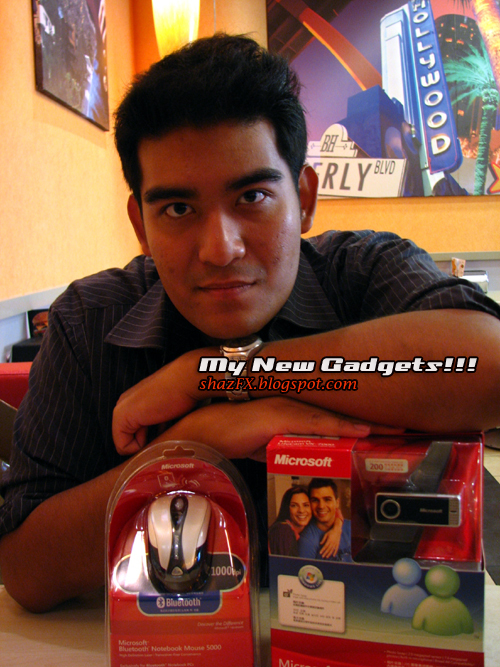 Product review will be up soon, online, on air, and on publication! (Haha...find out what i'm up to..in the publication line real soon!). Ok, let's go to the eating part! 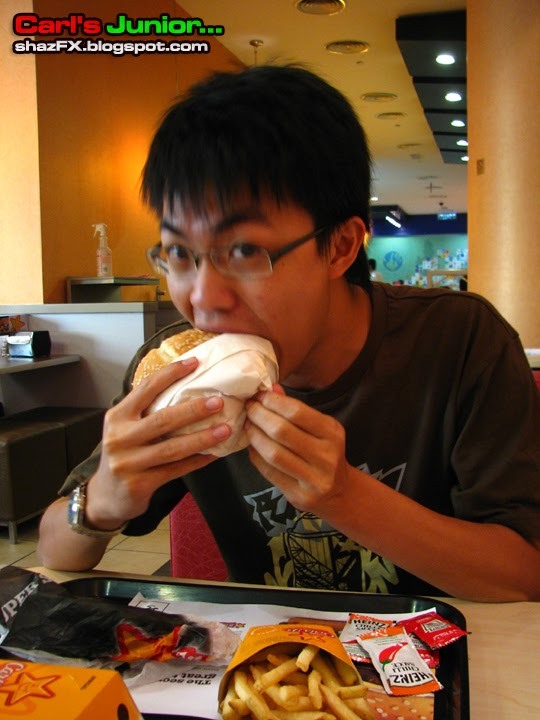 Ken eating his Double Bacon Western Cheeseburger! We had so much fun, laughing... chatting! And catching up! The last time we all met up was like last october! Cecilia in Blue, my friend from Singapore...! T'was awesome catchin up with her! Hehehe... i come singapore find u K! :P - belanja me Ben&Jerry's! Cecilia and Me... aiyo, i tell you! She must be using some superb shampoo!